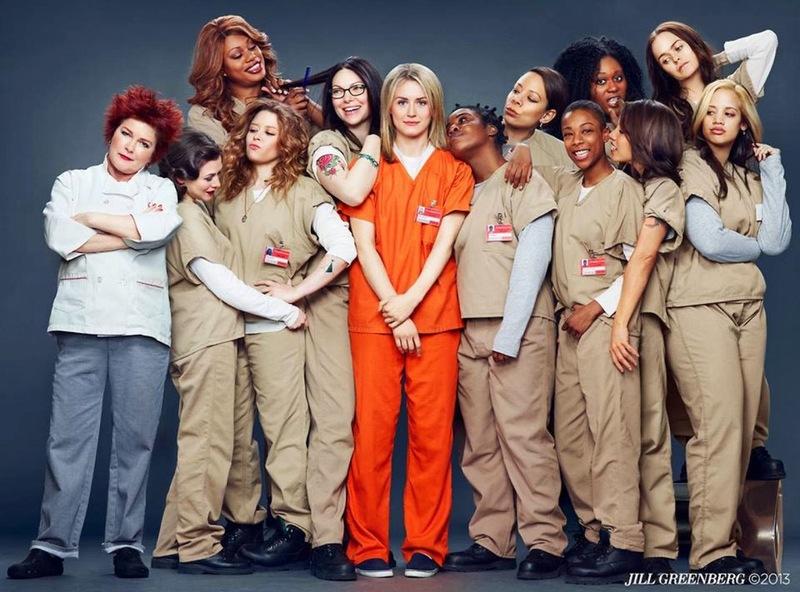 Kirstiekins Blogs: Are prison drama's glorifying prison? Are prison drama's glorifying prison? I'm not going to pretend that I haven't been caught up in this summers hottest new drama series Orange is the new Black, because I have, and if you haven't seen the show then you are seriously missing out! The interesting mix of characters have all been locked up in Litchfield prison for their various crimes, and we follow their daily lives including flashbacks, romance and life on the outside world. 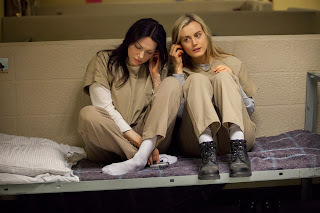 The show revolves around Piper Chapman (Taylor Schilling), who has been imprisoned for being part of an international drug ring with her ex-girlfriend Alex Vause (Laura Prepon) 10 years prior, however what Piper doesn't know is that her ex is also in the prison, and she is still pissed at Piper for leaving her! I won't give much more away in case you haven't seen it, but lets just say that Pipers new fiancé isn't happy about the events that unfold. After sitting down and watching every episode back to back, I came to the conclusion that I could easily survive in prison! Just don't insult the food, stay away from the redneck meth heads, and always wear flipflops in the shower, but surely prison isn't really like that? I have always had a strong image in my head of what prison was like, however every prison drama that I watch seems to contradict all of the expectations that I have! The ladies of Litchfield (who are portrayed by some amazing actresses) aren't the only prisoners that are bringing in the viewers at the moment, as hit Australian prison drama Wentworth Prison has finally come to the shores of the UK! The show is a revamp of another Australian show from the 80's, however these prisoners live a very different life to the glamourous ladies of the Netflix Original series Orange is the new Black. Inmates at Litchfield have an element of freedom, they have jobs, friends, social circles, love lives of which the viewers get so see and and 'ship' and they can even take trips to the resident transgender hair dresser! We get to see a lot of aspects of the different characters lives, which I think is great for the plot of Orange is the New Black, as the audience can see prison from many different points of view. My favourite so far has to have been when Piper was screaming at the crippled teenage gangbanger about how life is on the inside! Wentworth on the other hand has a different approach to life in prison, although the inmates have split into their own groups, we only see what the main set of characters are up to, but we do get to see a lot of the prison guards lives in and outside the prison! Wentworth seems like a stricter environment, due to the older prisoner Jaquie who seems to run everything everyone does, but I still think I could survive in prison! I'm not saying I could be the next queen bee of some random prison somewhere because I don't ever plan on going to prison, however if I was to happen to find myself locked up I could probably survive! I'm not that little girl who can't stand up for herself any more! I'm not stupid, I do know that prison is obviously very different from how it is portrayed on TV, but I'm presuming I'm not the only person who has has suffered from the CSI effect from this show! I know for a fact that after watching CSI I thought I could easily investigate crimes/commit the perfect murder! How about you!? What are your thoughts on this? Could you survive in prison? Comment below or tweet me with your reply!